← Anybody Seen My Wagon? A wise friend taught me the practice of looking at something beautiful every day. Today, on a brisk walk through the wintry neighborhood, there was much to admire. The sky at noon was a rich turquoise blue, a gift blown in on a cold front from some faraway place up North. The bark on the apple tree shone silvery red in rays of sun that for a second warmed my face. 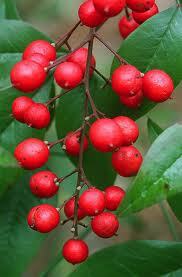 Bright red nandina berries, fiery in the light, ignited a cluster of frozen shrubs. Sweet round dogwood buds and tightly furled rhododendrons curved in the direction of the light, like open hands at the altar, awaiting Spring with astonishing faith. The rustling feathery stands of bamboo towered glamorously above their frozen neighbors, laughing at winter. Their glowing greenery evoked warmer times to come: soft scented nights, bare feet, the song of fountains and cicadas.